I recently had a film night with a few friends and we watched this movie which I’d never seen before and it reminded me of my blog. It’s been a long time readers. Please forgive my hiatus. I shall reward you with one of my classic style reviews. 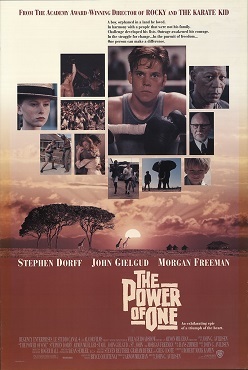 Based on the book by Bryce Courtenay, The Power of One is set in South Africa during the 1930s-40s, and follows an English orphan named P.K. who faces prejudice from his Afrikaaner classmates. Taken on by an elderly German pianist who, upon the outbreak of WWII, is interned in prison, P.K befriends black inmates, learns how to box, and listens to stories about a mythical rainmaker who is to bring unity and stop the infighting among the tribes. P.K. works to fight injustice and challenge adversity while befriending people based on the content of their character rather than their skin color or ethnic background. The film came out while South Africa was still in the throws of Apartheid, an incredibly oppressive system of racial segregation, and the movie covers the time period of the genesis of apartheid. At first I thought the title was a reference to the power of one individual, especially since it follows the exploits of one boy who through facing shameful bullying based on prejudice developed incredible empathy for those who experienced even more systematic oppression. P.K. then works to provide training for black teachers so that they can teach people how to read and write English, education that was illegal. However knowing history it might look as if P.Ks efforts were for naught. Apartheid continued for another 50 years after all. But in reality I think the title is actually a reference to the power of becoming one, the power of unity. Throughout the film the biggest accomplishments were when people came together despite their differences. Whether it was a German pianist helping a Zulu prisoner, or an English boy conducting a concert of people from all tribes, or an Afrikaaner girl joining English and black South Africans to teach literacy, it was when diverse people came together for a united purpose that we saw beauty, that we saw hope. Unfortunately there were many times in the film, and even more so in the history of South Africa and the world more generally, that people were unable to come together and instead were blinded by difference into conflict, often brutal and sometimes even lethal.